Crepe and Black Lamps, 1986, oil on canvas, 58 1/4 x 48". Although Don Van Vliet is better known as Captain Beefheart, his first passion was sculpture; it wasn’t until the early ’60s that he devoted himself to the avant-garde blues and rock music associated with his more ludic moniker. In the early ’80s, Van Vliet put music aside and turned to painting. These two nearly concurrent shows (Michael Werner’s closed June 29) present an ample survey of these later pictures, up through the late ’90s, when he stopped working in the medium. 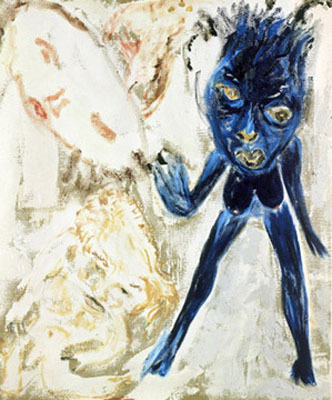 Though a neo-primitivist aesthetic is evident in both the artist’s styling of figures and his recurrent imagery of rites and rejuvenation, the largest influence on Van Vliet’s work is that of the CoBrA painters. He frequently imagines frenetic barnyard scenes involving battling and copulating animals: The Drazy Hoops No. 1, 1997, portrays a bizarre crossbreeding, with a sort of yellow cat appearing to mount a black boar. In Fur on the Trellis and Just up into the Air, 1985, one clawed, donkeylike creature flays another. Only once, in Feather Times a Feather, 1987, is a farmer visible, though he’s overwhelmed by the colorful plumage of cockerels and other birds. Michael Werner undoubtedly had the better pictures: White backdrops shivered with choppy impasto, colors sang, Van Vliet’s marks switched between broad strokes and detailed linear motifs, and even the most abstract pictures managed a powerful coherence. The works at Anton Kern, though equally ambitious, seem more fragmentary. Still, the work in both shows bears evidence of a serious, committed artist.